After a highly anticipated opening last summer, the Santiago Calatrava-designed Margaret McDermott Bridge in Dallas, Texas, has been plagued with cable rod issues, according to the Dallas Observer. 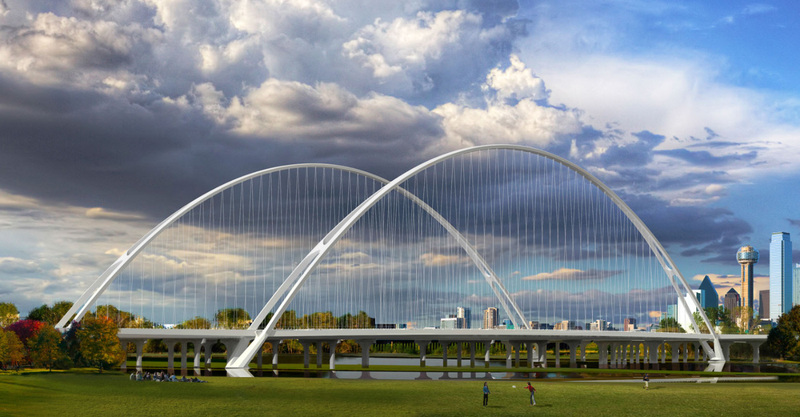 The Margaret McDermott Bridge spans the Trinity River and is part of the Dallas-Fort Worth region’s Horseshoe Project, a plan meant to revitalize downtown Dallas by addressing the city’s traffic congestion. Work on the Margaret McDermott Bridge was spurred on by the public’s reception to the iconic Margaret Hunt Hill Bridge in 2012, a cable-stayed bridge supported by a 400-foot-tall, central, arched pylon. While the concrete core of the Margaret McDermott Bridge, which extends Interstate 30 and supports vehicle traffic, opened in 2013, the 1,200-foot-long suspension arches, designed by Calatrava, were appended to both sides of the bridge separately to give it a “signature element.” The east span was supposed to support the bike and pedestrian lanes, but has remained closed due to safety concerns after several engineering issues came to light. In a bid to save as much money as possible, the construction contractors and city of Dallas worked out an agreement to skip stress testing for the design, which would have spotted the vulnerability earlier. The use of smaller, cheaper adjustment rods, has led to the cables vibrating in the intense wind over the river, and both the walking and bike paths remain closed since the bridge’s completion. Heavy dampers were later installed to minimize the movement of the cables after several failed, owing to the undue stress caused by the vibrations. Both lanes currently remain blocked with notices that threaten legal action against trespassers. The spans have been causing problems since their inception. After Calatrava initially proposed a $200 million bridge with four arches, the city was only able to wrangle $92 million, knocking the two interior archways off the bridge. The cost soon ballooned to $115 million, which the city promised to make up for through donations and value engineering; it now seems that original decision will end up costing the city even more money down the line. Calatrava argued that the testing should have gone ahead and offered to pay out of pocket. Some have questioned the installation of a suspension bridge near Dallas, real or fake, in the first place. Calatrava’s projects are no stranger to controversy, from the highly publicized leaks in the lower Manhattan Oculus to the recent halt in construction on the World Trade Center complex Saint Nicholas Greek Orthodox National Shrine. It remains to be seen how much it will cost to fix these engineering oversights, or how much of the blame will fall on Calatrava.